There are still those who are only just cottoning on to the existence of the ‘other’ hidden Facebook inbox. 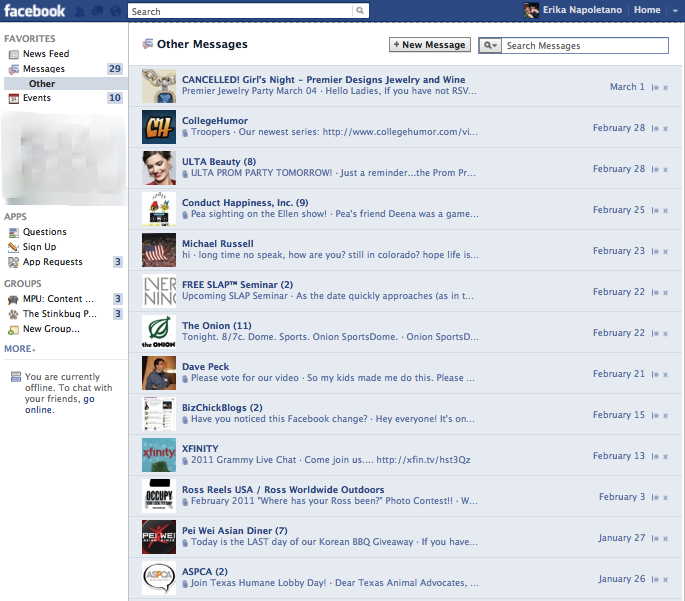 For those who are less sure, it is the secondary inbox used to collect messages from people who are not your ‘friends’. The problem though, as most Facebook users are ow realising, lies in the fact that this second inbox has a knack of collecting the occasional important email. It’s therefore well wort your while to occasionally check it. The problem is, Facebook does not notify you when these messages arrive. Unlike your reglar inbox, where the little red notification appears, there is no outward way of knowing how many messages are stored in this second inbox. That is of course, unless the sender has decided to pay the $1 per message Facebook guarantee, which ensures that you get the message in your main inbox. Therein, lies the real reason for the existence of the secondary inbox, but i run the risk of digressing. Up until very recently, the only way to access this other inbox was via logging into Facebook.com (which increasing percentages of Facebook users never do anymore), and navigating into messages, and then into the other inbox. However, the latest Android beta app has the other inbox included, indicating that Facebook are finally making their user experience more platform agnostic. The new app features some new functionality, including a gears icon next to messages in the main nav bar. Hit the gear button, and that gives you access to the other inbox, where you may just find a long lost message, or then again, nothing at all. There you have it, a quick guide to accessing your other Facebook inbox on the Facebook Android app. If this guide has been useful, please share it with your friends using the social buttons on the left.